Startup founders range from the creative visionaries to the technical engineers, but no matter your background expertise, one thing is key: it is important for you to have a plan in place for your books and records. Accounting is the framework that you use to track and report business performance both internally and externally. It is a language that can be used to inform important business health metrics like sales momentum and cash burn, and these are often used by founders to analyze their businesses and by third parties like venture capitalists when making decisions about whether or not to invest in a company. Accounting processes are required in order for businesses to complete their annual tax filing process with Internal Revenue Service (IRS) and are also critical for financial audits – audits become more important as a company gets larger and are typically mandated by investors in later stage financing rounds. Today, all modern companies use software to manage their accounting processes. By far the two most popular are Intuit’s QuickBooks Online and Xero. Both SaaS products are relatively inexpensive, support many third-party integrations and provide simple reporting. QuickBooks Online is the likely first choice for startups and is often praised for its ease of use. Xero gained traction among startups by being the first to market a cloud-hosted product. It is a common choice among founders who started a business outside of the U.S. It is very common for startup founders to work with an outsourced accountant or accounting firm to help manage their books and records. Every major startup hub has a number of individual accountants and accounting firms that have emerged to help the startup community with their books and records. Recently, venture capital has been pouring into the space with investments in accounting automation companies like Boston’s botkeeper, Austin’s ScaleFactor, and Silicon Valley’s Pilot all receiving funding. Outsourcing can save you significant time by leveraging professional experts who complete accounting quickly and accurately. Also, having a third party prepare your books and records mitigates the risk of errors. However, outsourcing is expensive – third party accountants can charge anywhere from $500 to upwards of $10,000 per month. 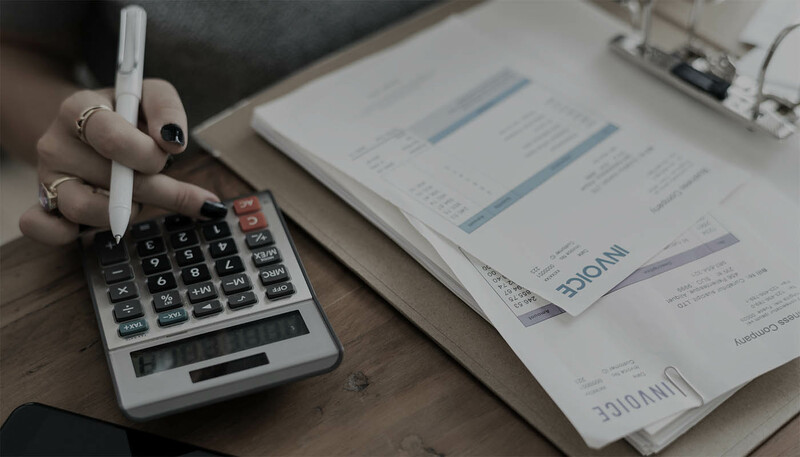 Additionally, outsourcing is often only a temporary solution as if your company scales, you are likely to need to bring accounting in-house anyway. As with any outside consultant, vendor management is critical and you must remember that even though an outsourced accountant is supposed to provide you leverage, you still need to check in with the vendor and regularly assess performance, or you are likely to be disappointed with the relationship. 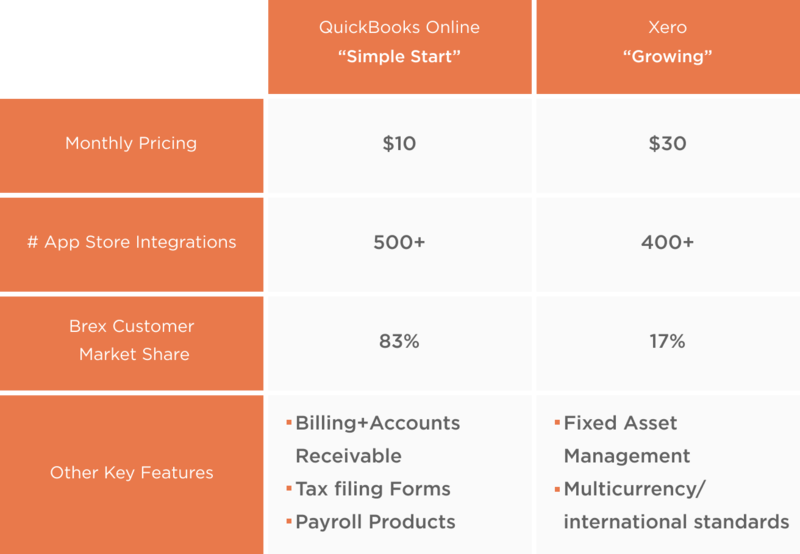 Many outsourced firms use QuickBooks Online and Xero, but others actually implement their own accounting software / ERP as part of the outsourcing process. Outsourced firms that use their own proprietary accounting software include Bench and InDinero. If you make the decision not to outsource your accounting, the first step you need to complete is setting up some basic reporting and tracking. You do this by completing your Chart of Accounts. The Chart of Accounts, sometimes called the General Ledger, is the map that you use to classify the activity in your business. First, the Chart of Accounts tracks the status of your company in the form of the assets you have in your business, like cash, receivables owed to you, inventory and furniture. Second, it tracks the liabilities you owe such as outstanding payments to suppliers and debt. Third, it tracks the investment into your business in the form of equity and cumulative profits / losses. 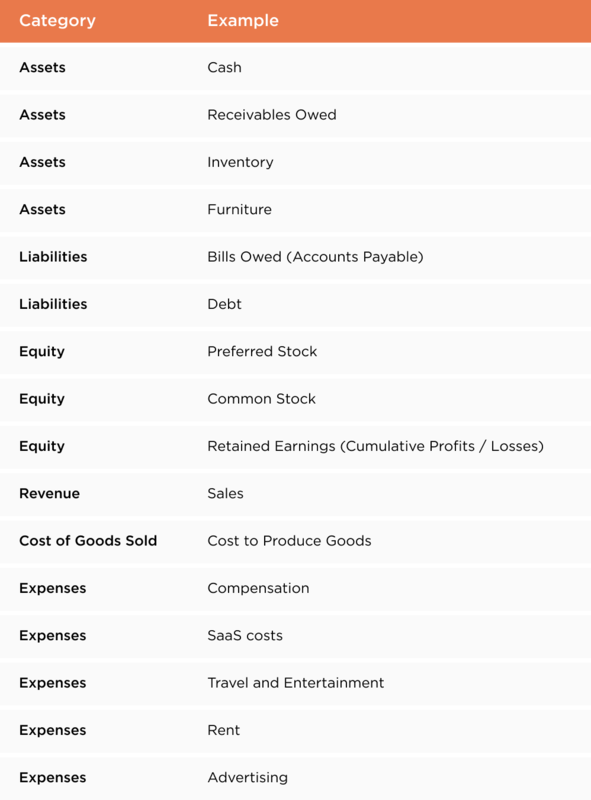 These items will all ultimately form the Balance Sheet of your company. The Chart of Accounts also classifies the activity in your business such as sales, cost of sales and various forms of expenses. This type of activity ultimately forms the Income Statement of your company. Once you create the Chart of Accounts, you can use it to classify every activity in your business. For example, if you receive an investment of preferred stock, it will impact the Preferred Stock and Cash accounts within your Chart of Accounts. Once your Chart of Accounts is established, it is important to integrate as many applications as possible within your accounting software, including payroll, credit cards and banking services. This will help you categorize the activity in your business automatically, and help prevent errors. Brex hired a CFO very early in its lifecycle and therefore did not need to outsource any of its accounting functions. Brex started on QuickBooks Online and integrated as many services as possible (payroll, banking, credit card) and even built a customer integration between QuickBooks and its back-end system to track revenue reporting. After two years of operations, Brex migrated to NetSuite which provides more robust accounting approval flows critical for the types of financial control and IT audits it regularly completes.